One of the key drivers behind this blog – and my urban prehistory project – is the sense that traces of activities and structures from the past persist within contemporary urban landscapes, to the extent that even when there are no visible remains left of whatever was there previously, there is nonetheless value to visiting those places, and in some instances, marking them in some way, drawing attention to them. And at times, tangible traces of the past jut into the present, sometimes in unexpected ways – if we are willing to look for them. This is one of the key traits of psychogeography too, the subversion of urban rigidity through the exploration of older spatial arrangements and purposes, in order to reveal an unexpected and invigorating way of engaging with modern urban homogeneity. Psychogeographers rarely apply such approaches to prehistoric traces, and although that has been my focus to date, I understand the reasons for this. More recent structures and activities can much more easily reveal themselves in, for instance, street layouts, the kink of a wall, the location of a road junction, street names or the shape of a garden fence. Thus, recently, I stepped back from prehistory to look at a very different kind of structure that persists in recent memory in a very familiar urban landscape, the retail park. 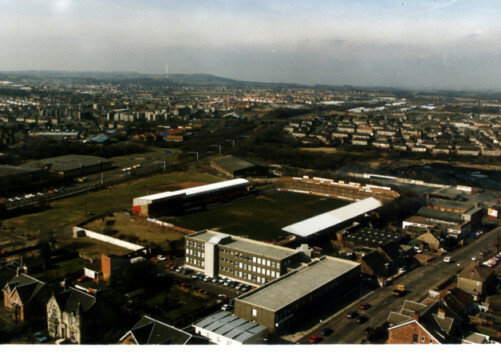 I wanted to explore to what extent the old football stadium of Hamilton Academical FC, Douglas Park, demolished in 1995, still has a material presence amidst a supermarket, fast food drive thru, assorted retails spaces and a big car park. 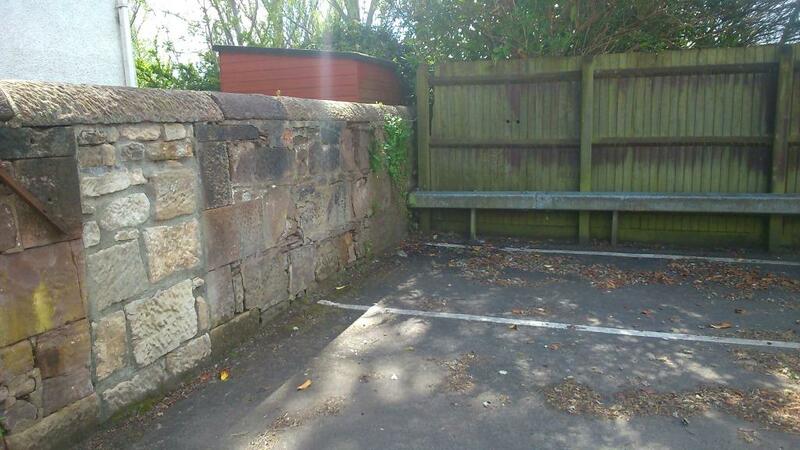 My exploration of this urban space included, perhaps surprisingly, prehistoric allusions, and finished in another car park, that of the New Douglas Part stadium, within the structure of which is a brick with my name on it. My walk started with a drive, to the supermarket car park where Douglas Park once stood (and for a map of this location, and my walk route, see the end of this post). There were ghosts in the car park as I left my car and walked through it. On the ground were white lines for parking spaces and junctions where once there were white lines defining penalty boxes and a halfway line. There are now bollards and signage where there were once goal posts. Shoppers drift past me pushing trolleys where once wingers drifted past defenders. 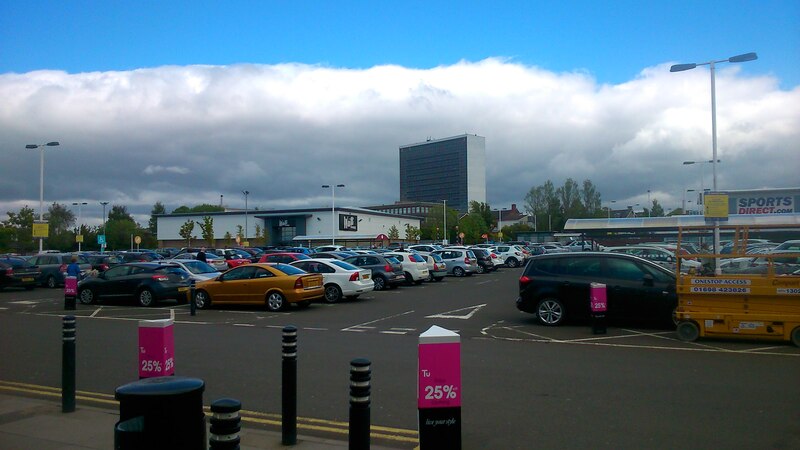 I started my walk somewhere near the northern penalty box and away terrace had been, now in the shadow of the entrance of an orange and white supermarket, looking towards the South Lanarkshire Council high rise which dominates the horizon line. Through the car park I walked, across where the pitch had once been, focused not on the shops there now but what was once here. 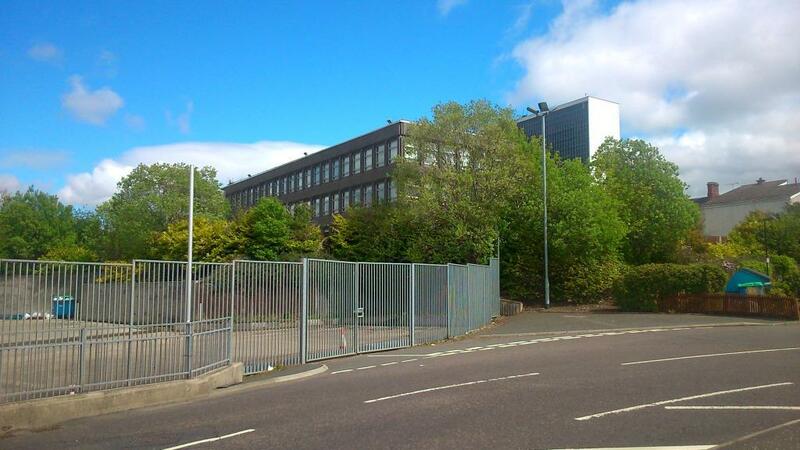 Then a familiar view – a grey low building, behind some trees and a fence. A familiar building, one that used to loom over the home terrace at old Douglas Park, a building I saw hundreds of times as I looked over towards the ramshackle shed stand on the east side of the stadium. 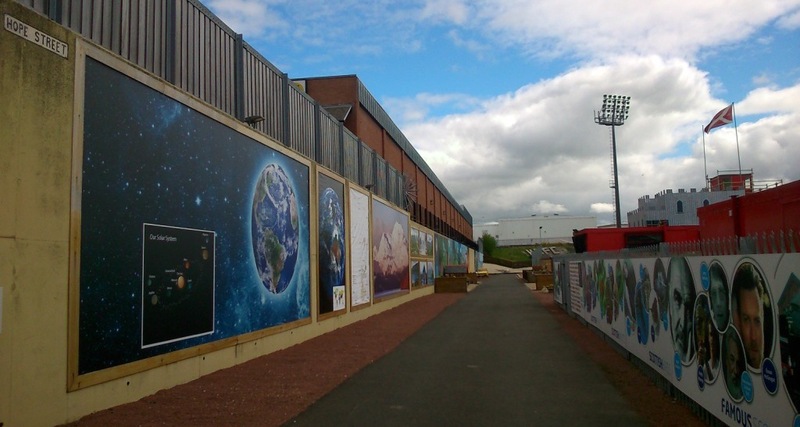 It was also in full view during the short walk to the home turnstiles from Douglas Park Lane (now warped and bent into a new form, servicing the retail car park) – and upon entering the ground. The same grey building viewed from the pitch in this photo from an Accies v Rangers game on 13th August 1988. 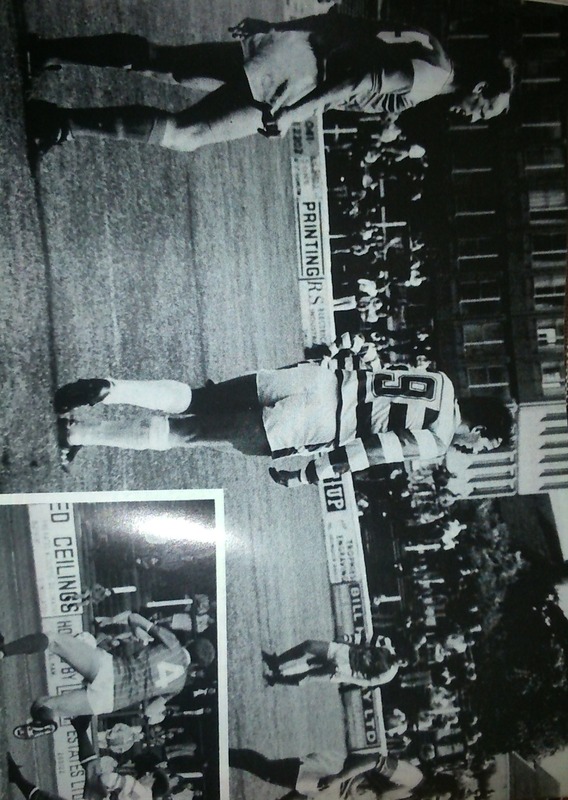 The match shown is an Accies v Blackpool pre-season friendly, and Accies’ number 9 is Colin Harris. Past this, nothing brought back memories other than Hamilton West railway station to my right. Otherwise, it was fast food and fuel, pavements and pedestrians. I left the car park and onto Clydesdale Street, where I walked past various 19th century sandstone buildings, now mostly commercial establishments like nurseries and dentists, with façades that afforded no view onto the location of old Douglas Park. 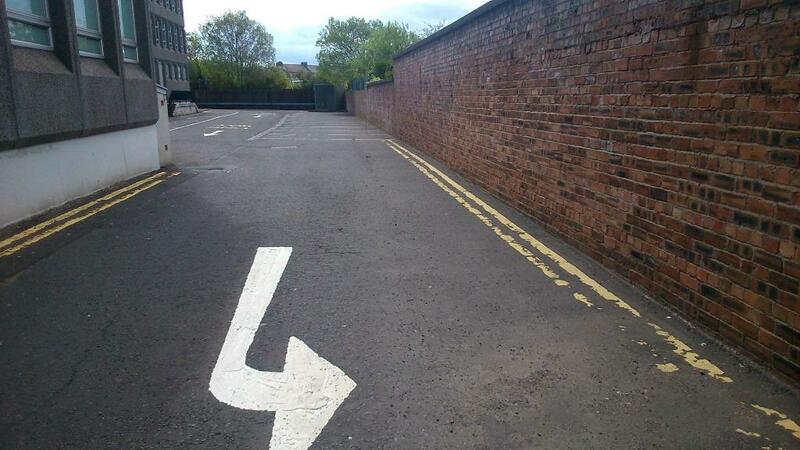 I turned left onto Douglas Street, the only street name that echoes the football ground that was once here. 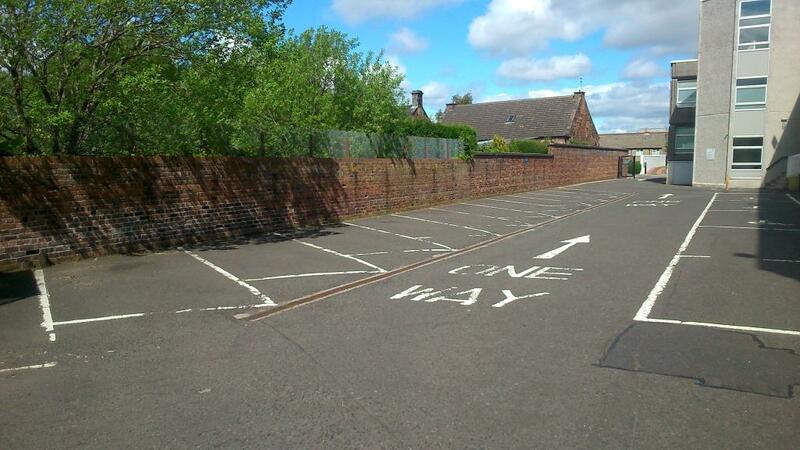 Across to the right is the huge Caird Street council car park that my dad and I used to park in before games. To the left is that grey blocky building, like a pair of huge lego bricks arranged perpendicular to one another. This is currently a Community Health Clinic, and I walked into the empty car part (it being the weekend) to see if any traces of the old football ground survived. An old wall to my left looked promising but was not quite right in terms of being part of the infrastructure of the ground, while straight ahead was a modern looking and austere wooden fence, greening through neglect. Is this related to the football ground? Probably given its location. 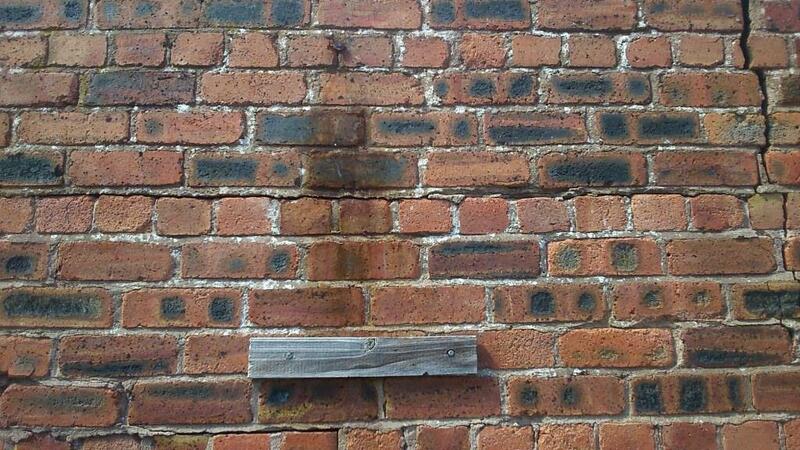 And towards Douglas Street, I spotted a small rectangular piece of wood affixed to the wall just below head height. Seven courses of brick directly above it, symmetrically placed, was some kind of nail or screw, and between the two a stain. Is this the remnants of a plinth to which a sign was once fixed to guide supporters? Given its location on Douglas Street, across from the car park, this seems likely. Sadly, nothing else was discerned on my walk, despite me accessing the garden of a dentist surgery, and later peeking behind an industrial unit. A few old brick walls were evident, parallel to the wall with the writing, although it is likely these define 19th century garden and property boundaries. And so, 20 years after it was demolished, next to nothing remains of this football stadium, at least in situ. Pieces of this place were dispersed around central Scotland, and perhaps even further. The components of the stadium infrastructure ended up in different places after demolition – the turnstiles went to Brockville Park in Falkirk (itself demolished in 2003) and the stand was taken apart, and re-assembled at the ground of Auchinleck Talbot in Ayrshire (where for all I know it still stands today). Some of the floodlights used to be stored in a bus depot in Stonehouse if I remember correctly. How thoroughly the stadium was dissembled beyond these acts is unknown. Fixtures and fittings were no doubt kept as souvenirs by staff and fans, and it may well be that some turf from the ground was dug up and transplanted elsewhere after the last reserve game was played there in early 1995. 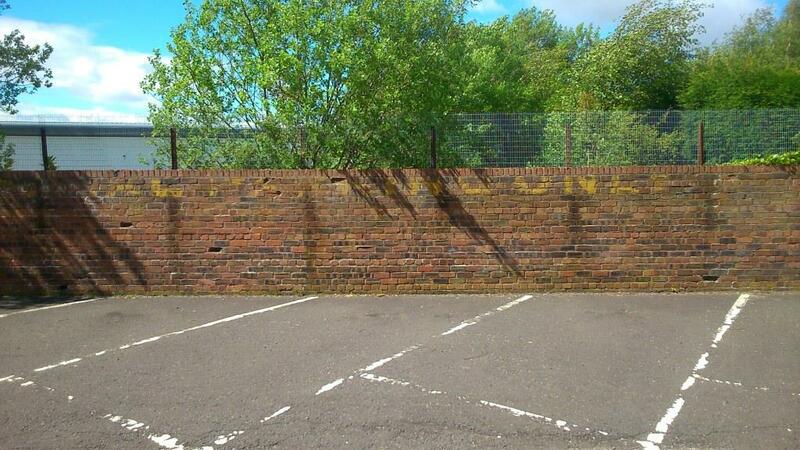 Fans may have genuine Douglas Park bricks, or the penalty spot, in their garden. It is likely that bits and pieces are also stored in the New Douglas Park, or on display in the director’s boardroom, portable memories. Aside from such relics, the material remains of this place are now gone. How quickly it has been forgotten. How rapidly this changed from a place of entertainment (!) and leisure to one of commerce and junk food. And yet, it could be argued – and indeed the local Council have stated – that the replacement of the crumbling not-fit-for-purpose old Douglas Park with a supermarket and retail facility (and the subsequent construction of a second supermarket immediately behind the first one as part of the development of Accies’ New Douglas Park in the early 2000s) have been a major element in the regeneration of this area of Hamilton – Whitehill. This is a council housing estate which over the years has had a poor reputation and serious problems with drugs, unemployment and gang culture. A strategy over the last decade of improvements in facilities, tidying things up and installing public art could be viewed as a simplistic pseudo-capitalist solution to the problems of this area, but the Council’s own statistics seem to suggest it is working (although to what extent I am unsure). So from the ghostly car parks of old Douglas Park, I headed away from the double retail park (why are so many concrete places called ‘parks’?). Walking along Auchinraith Avenue I saw evidence of this regeneration – a new primary school and new secondary school, and then, a few hundred metres beyond this, at the junction with Margaret Road and Hunter Road, a new community centre. I had driven past this place a month or so previously and spotted standing stones at the road side, and so I wanted to go back and investigate. 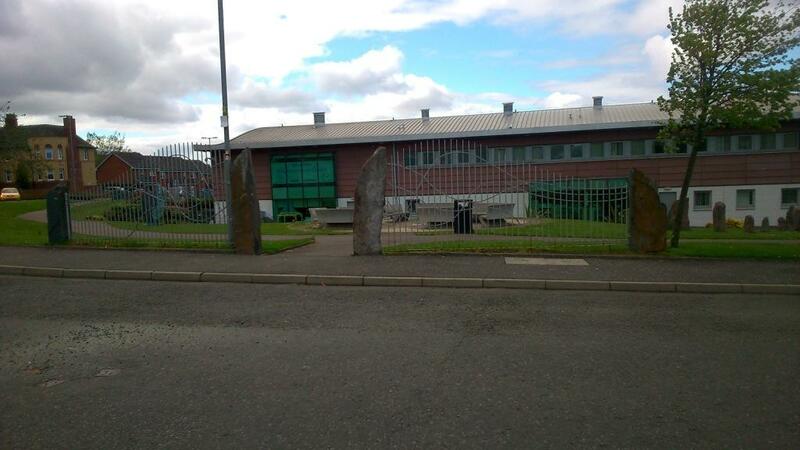 Sure enough, as I approached, ahead of me was a small grassy area (another park) at the rear of the Whitehill Neighbourhood Centre, adorned with various megaliths, the most obvious of which were four angled slate slabs supporting a gate and fence. This is quite a peculiar arrangement, as it is clear that the nice metal gate supported by two of the standing stones is completely obsolete as the fence is insufficiently long to fence anything in. Even if the gate were closed and locked, one would not have to walk far get around this obstacle. So far, so-slightly-pointless public art. 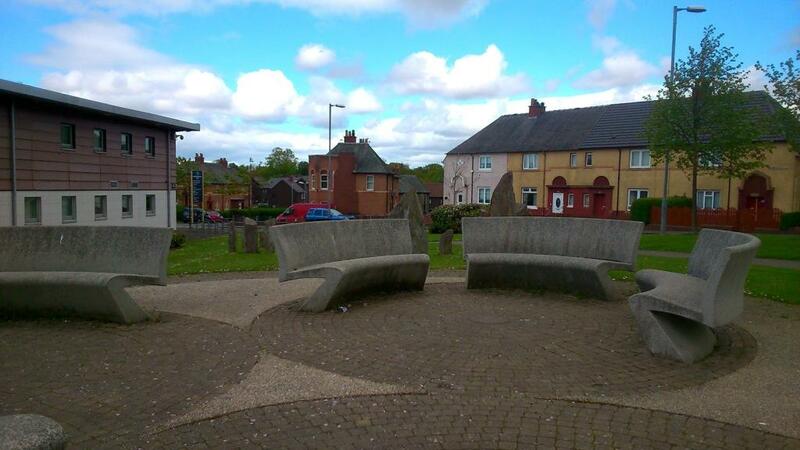 Beyond this weird gate arrangement: a series of seriously megalithic benches, all concrete curves and cold edges, three shades of grey, arranged in several small circular arrangements, the geometrical pattern of which is only apparent from the air. I sat on one of the benches to send a tweet, but I was unable to find a comfortable way to perch upon them. 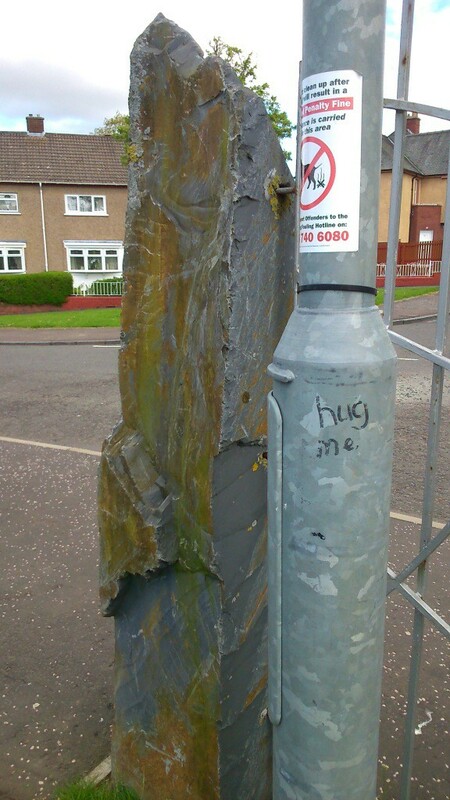 Beside one of the gate post slabs is a lamp post, with these words written on it: hug me. 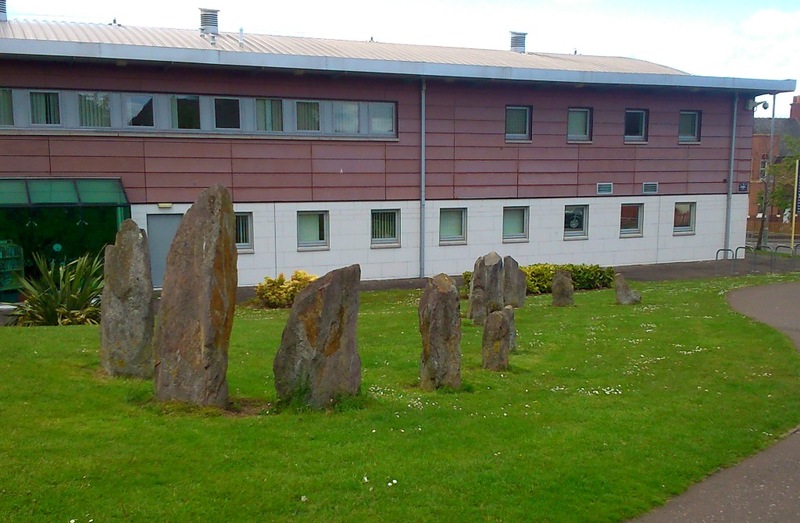 This stylised arrangement of concrete, slate, sandstone and iron gave me a rather cold feeling, my immediate response being that this was the kind of tokenistic standing stone space fillers that crop up all over the place these days. The cold concrete benches and the curving row of stones had a certain kinaesthetic property that suggested dynamism, but on a quiet and chilly Sunday afternoon, this was a silent place. Perhaps with the buzz of children playing amidst the stones (yes, children of the stones) this becomes a very different place. 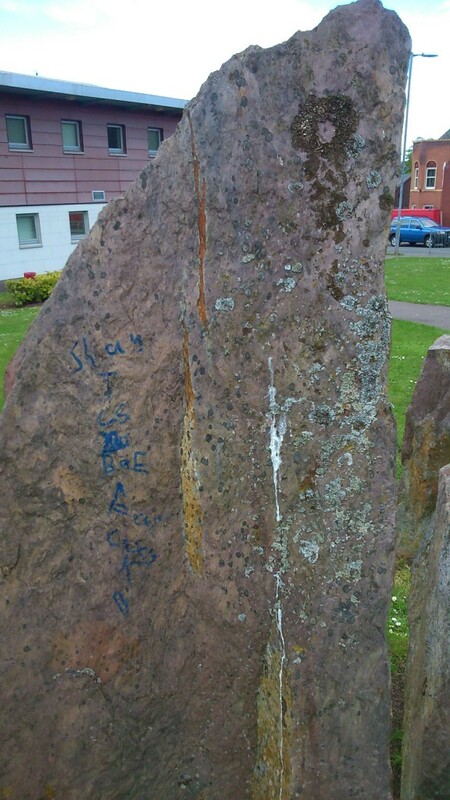 Thought to self: standing stones need people. 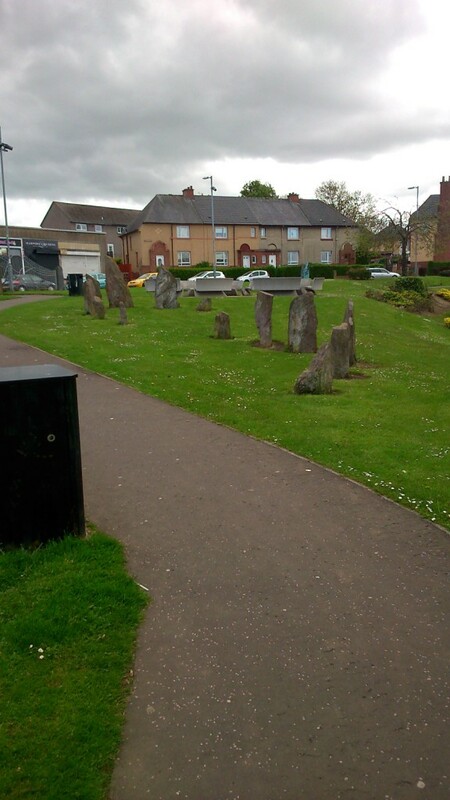 And people apparently need standing stones. 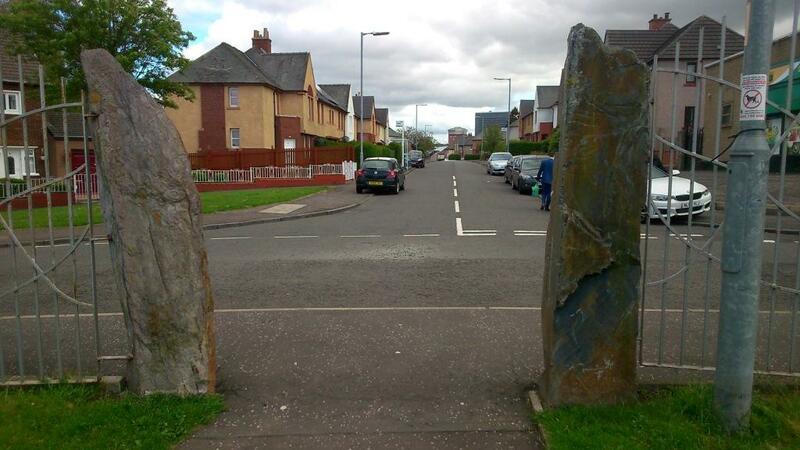 This new community facility and the new megaliths that accompany it are part of the aforementioned regeneration of Whitehill, and so it is fitting that an explicit piece of art here reflects this aspiration. On the other side of the concrete benches is a sculpture of two giant leaves. 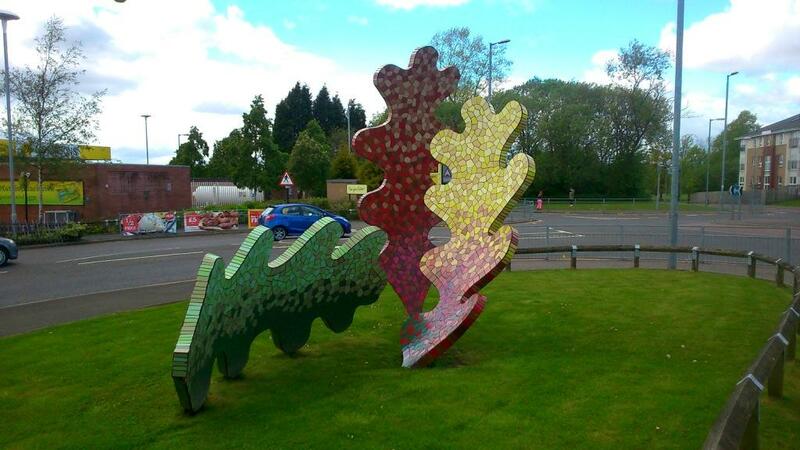 This is a piece called ‘Turning over a new leaf’, and was created by Rachan Design. 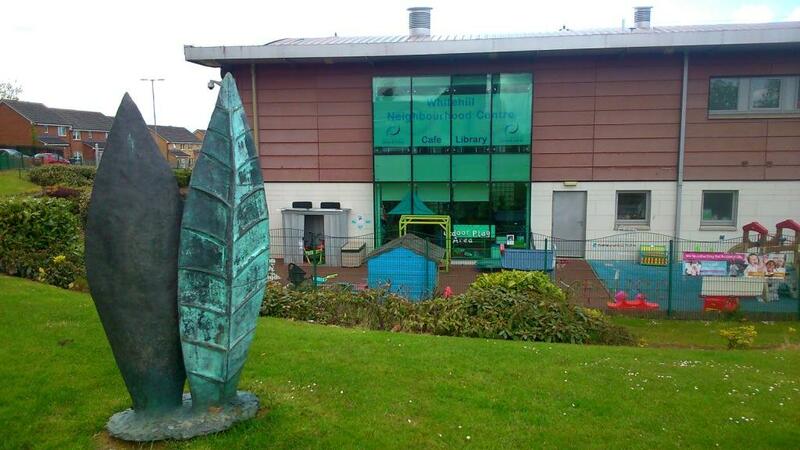 It was designed with help from the ‘Whitehill youth group … to reflect regeneration within their community’ and is made of bronze and is 1.9m tall. Turning my back on this rather jumbled series of metal and stone uprights, I looked back between the slate standing stones, back along Auchinraith Road to where I had come from earlier on. There in the distance was a clock tower, but not that of a church; rather of a Morrisons supermarket. I couldn’t help reflect that the Council claims of improvements here might actually just be superficial and glossy, and perhaps not that inclusive. Rather than hang around in the new ‘high concept design space’ provided round the back of the community centre, a small group of local kids stood nearby at the true focal point of this part of Whitehill; a Day Today Express grocery store, Get Stuffed ice cream and takeaway, and Harper’s and Queens (hairdresser?). This block of shops seemed a million miles away from the shiny supermarkets which are actually less than a mile away. The kids looked at me in a disinterested way. I’m used to it. 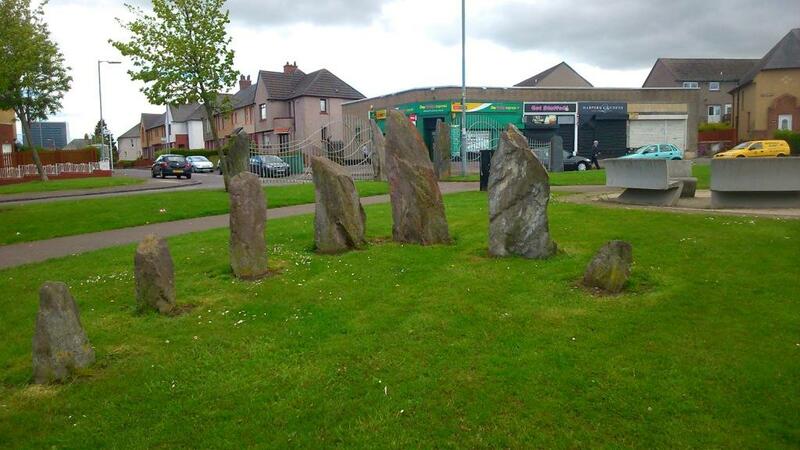 I do hope the standing stones have, or will, become a local focal point, a matter of pride, a conversation starter, that they serve some purpose. I hope they have not become obsolete just yet, or laughed at, or ignored. Walking back towards the rear of the retail complex, I wandered round into yet another new car park, the largely empty one outside New Douglas Park. I reflected on the memories of the old stadium just a goal kick away from where I stood, and how improvements are certainly evident. 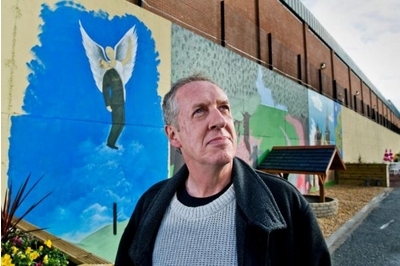 The fortunes of the football club have improved since it moved location after some difficult years out of the town, and there is a sense that this is a community club, on the edge of Whitehill, contributing to the life of the town. ‘It’s an ongoing thing. It’s developing all the time. It’s a living energy and the people who all work here are incredible’. Hope seems as good a place as any to end my walk. And so my walk finished with an unsatisfactory coffee in, where else, a supermarket. In a sense I was disappointed, as I found little material evidence of old Douglas Park. Somehow, in two decades, it had been almost wiped out. And look online – there is almost nothing there either, a few poor quality photos only. Virtually and literally there is nothing left, only memories and photos in private scrap books and forgotten envelopes in drawers. And yet I detected something – an essence perhaps – channelled through my own memories. Because I spent literally hundreds of hours standing in the place that is now a car park, on the terraces, leaning on a metal barrier, spending time with my dad. When I walked to the ground with the grey concrete council building in front of me, I was walking along my own version of ‘Hope Street’ even it is was really just good old Douglas Park Lane. Places really can persist through emotion, memory, attachment – and no amount of urban cleansing can change this. Perhaps this sense will only persist as long as there are Hamilton Accies supporters (of a certain age) who visit this place, always aware of what was there before, what has been lost. I’m not misty eyed and daft. Nothing endures forever. Change happens. In urban spaces and places this is especially true, and things have moved on now. I cannot visit this car park, this supermarket, this place, without it still being that place. Sources and acknowledgements: the colour photo of ODP from the south was printed in an article in The Scotsman in 2012, while the black and white football action shot came from an Accies programme (more information in the caption). 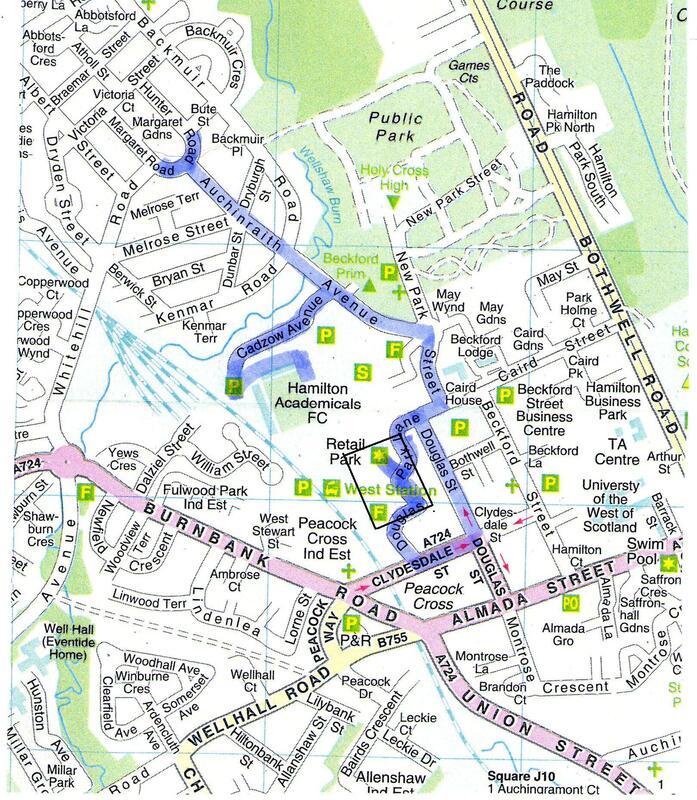 Information on Whitehill and recent improvements can be found in various places e.g. this good practice case-study from the Scottish Government website about urban green space development. 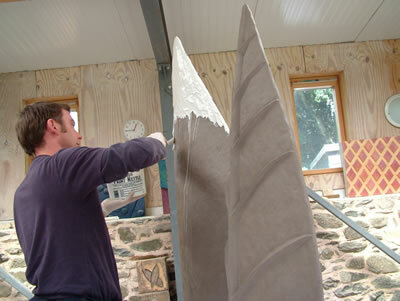 A little more on the Turning over a new leaf artwork can be found at the Rachan website (link in post) (and this was the source of the photo showing the sculpture being made).